It has taken centuries of advances to achieve the technology and knowledge required to confirm worlds orbiting stars that are light years away. Only since 1992 have we had proof that our solar system isn’t alone in the Universe. Now we know of hundreds of others and estimate that billions more exist in the Milky Way galaxy alone. The current picture being revealed through the latest state-of-the-art planet hunting telescopes shows us a Universe filled with the potential for life and civilization, even around stars we thought just a mere decade ago were inhospitable to life. 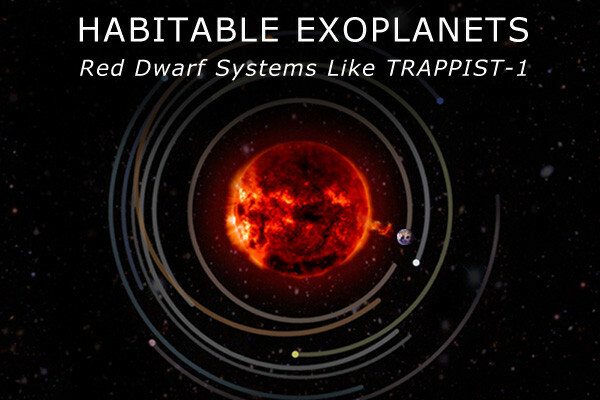 In my upcoming book, Habitable Exoplanets: Red Dwarf Systems Like TRAPPIST-1, you will discover some of the constraints and chances of planets being habitable around the most abundant type of star in the Universe – red dwarfs. These stars (comprising of both late K-type and all M-type) are at least 70% of all stars in the Milky Way galaxy. Their abundance comes from the fact that these stars are comparatively tiny, and thus much easier for the Universe to produce. Small as they may be, they have some interesting attributes that both cast doubt and hope on their ability to host life. While life has been located around our own star type (as we are here to talk about that revelation), it would be shortsighted to ignore the vast majority of stars simply because of some unknowns – many of which are quickly being overturned as you will learn about. 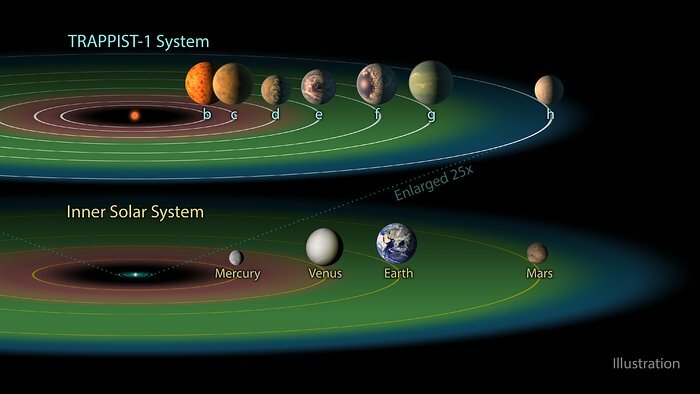 To aid in our understanding of how alien red dwarf systems can be to our solar system, I will be frequently referring to TRAPPIST-1 and the discovery of seven planets in that system. TRAPPIST-1’s configuration is optimal to allow scientists to test many of our assumptions on how planets form, and whether they can retain habitable conditions for the billions of years required for life to evolve. You will discover how a star both helps and hinders the evolution of life, and how planets can remain in a state of environmental balance to allow life to grow and evolve. We will also explore one particularly unique quality of red dwarf worlds that may provide an even greater capability for supporting life than we have here on Earth. A planet’s distance to its star, as well as its size, density, and composition are the primary considerations in determining whether it is setup to support other life-giving attributes like an atmosphere and surface liquid water. These features will also determine if the planet can form a protective magnetic field. For example, Earth is large enough for its interior to create a fluidic dynamo – the physical motion of material – in the outer core, which generates a globally encompassing magnetic field. This field keeps the solar wind at bay, preventing the oxygen-rich atmosphere from bleeding away into space. Even the tamest red dwarf stars are going to eject massive amounts of radiation many times greater than what Earth gets hit by our Sun. A magnetic field is the first line of defense against this barrage. An atmosphere plays many roles in a planet being hospitable to life. Without an atmosphere, all exposed liquid water would quickly evaporate into space, and the mass and gravity of a planet will have a strong influence on atmospheric composition. Earth’s atmosphere is composed of 78% Nitrogen, 21% Oxygen, and other trace elements. Oxygen levels in the atmosphere have fluctuated in the past, from as low as nearly 0% to as high as 35%. Oxygen also made – and maintains – the ozone layer, which is critical to shielding life from harmful UV radiation from the Sun. We don’t yet understand what red dwarf planet atmospheres contain in detail, but ozone is thought to be one strong possibility for a couple of reasons we’ll explore later. The remarkable achievement of detecting exoplanets is only the beginning of what will be realized in the decades to come. We live at a time where amateur astronomers can even get in on the action and discover entirely new attributes about these worlds. When a candidate planet is confirmed, we often see the contribution of an amateur astronomer being recognized. One such example is Andrew Grey’s discovery of a system with at least four worlds in a size class called super-Earths (slightly larger than Earth). Grey accomplished his discovery not with multimillion-dollar equipment, but by sifting through endless streams of data stored in archives from around the world. What computers and scientists may have missed is open for you as the ultimate treasure hunt of a lifetime. There have been hundreds of scientific papers over the last few years that have talked about exoplanets. 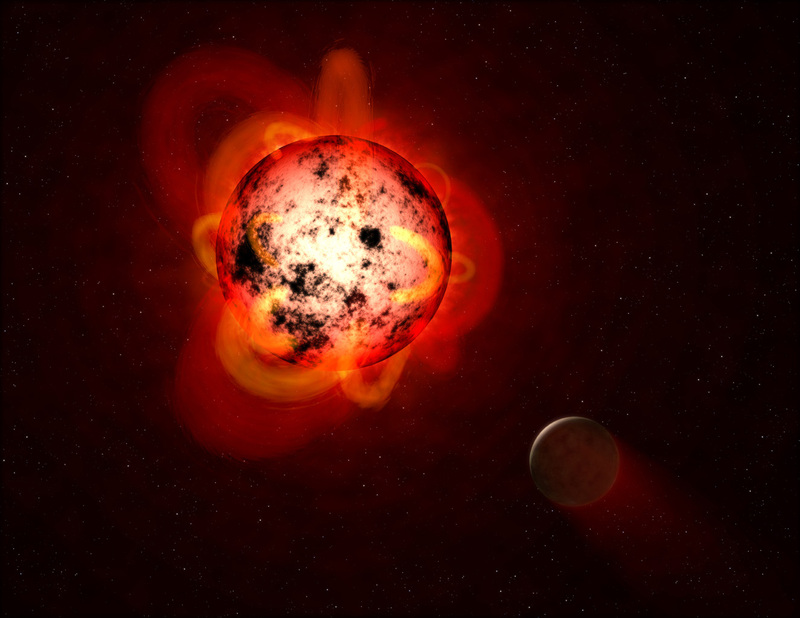 Especially since 2015, papers have dived into the idea of red dwarf planets having a protective magnetic field, for there to be an atmosphere with life-friendly gases and temperature ranges, and liquid water on their surface. While the knowledge we have gained is still highly evolving, it is quickly beginning to consolidate to provide us a picture of habitability. As soon as we can back up theories with additional evidence from the next generation of telescopes, we hope to have some definitive answers. To learn more about the intriguing possibility of habitable exoplanets, pick up Habitable Exoplanets: Red Dwarf Systems Like TRAPPIST-1 at Amazon. You can also get there my books in the Our Cosmic Story series. This series builds a big picture view of life and civilization, starting with Earth's history and then expanding beyond our solar system.